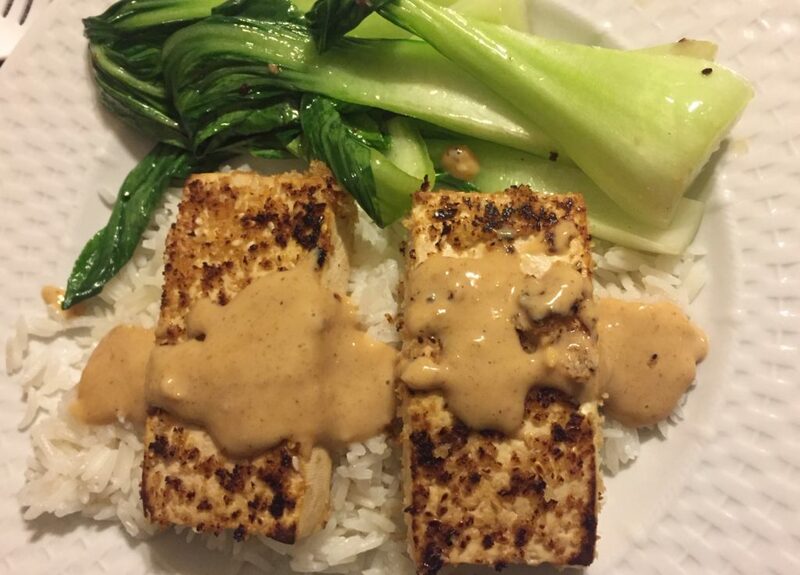 HelloFresh does not have many vegan meals, so I was happy to find this recipe for Sesame-Crusted Tofu with Spicy Peanut Butter Sauce & Garlic Bok Choy that I could hack for my vegan daughter. While it wasn’t a complete dinner – we have yet to find a way to make tofu taste like anything but tofu, outside of deep frying it -, my daughter loved the peanut sauce and enjoyed the coconut rice, I’ll be making both of those again (see recipes below). She hadn’t had bok choy before, and she won’t again – she found this vegetable utterly tasteless, even with the peanut sauce. Fortunately, there was extra broccoli from our meal for her to eat. Most importantly, she totally appreciated that I made her food. Given that she’s the only vegan in the family, she often is on her own as far as cooking goes, so any time I cook for her it’s a treat. Making this meal at home was rather cheap, as most of the ingredients are those you are likely to have in your pantry (peanut butter, rice, soy and hot sauce, sesame seeds), and those you don’t are cheap to buy. In all, I spent under $6.50 in this meal for two people. HelloFresh charges $20-$24 for the same food. If you’d like to subscribe to HelloFresh use this link to save $40 off your first box, and I’ll get a $30 credit – which I probably won’t use as I’ll be unsubscribing form HelloFresh shortly to try a different company. Rinse rice. Put coconut milk, water and salt in a medium saucepan and bring to a boil. Add rice, cover, reduce heat to low and simmer for 20 minutes. Fluff with a fork before serving. I got the following message today in response to my failed attempt at cooking Belizean rice and beans. I thought I’d share it with all of you who want to know how to do it right. Thanks Dorla! it comes out perfect every time. 1. Wash the beans, then soak beans for 4 hours, using the 6-8 cups of water. excess fat. You can use a pressure cooker to cut down on the time. add the salt if you used salt beef or pigtail above. 4. Add coconut milk. Stir and then let boil. warm up leftover rice-and-beans, you can sprinkle with water to re-moisten.